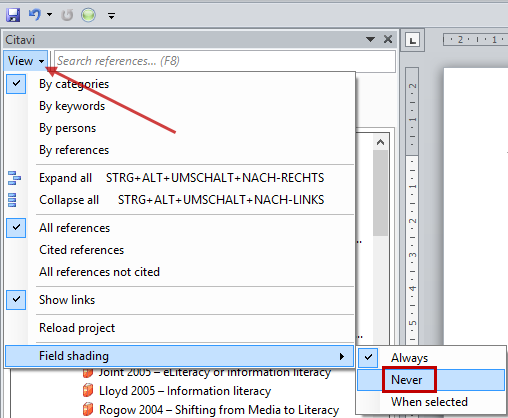 Citavi Forum • How to disable highlighting? I would like to disable the highlighting in the in-text citation in word. The editors of a journal (who do not work with Citavi) asked me to decode the citations and reference list, which are highlighted in gray because this is complicates the task of manipulating the manuscript. However, I do not know how to do this. Re: How to disable highlighting? With this command, a copy of your document is saved with all Citavi fields removed. NB: If you insert new citations into this new document, they will not be integrated into the plain text citations already present.